Cold, rainy, dark days also call for warm, comforting food - but also, I'd prefer that comfort food to be the kind that you can just come home to and throw in the oven no defrosting required. 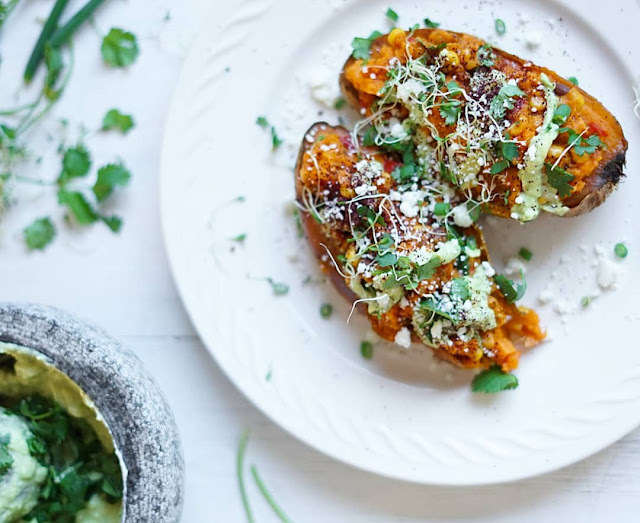 The internet / Pinterest is full of freezer-friendly meals, however a lot of them require tons of advance prep, or they require you to defrost before cooking, or they end up lacking in texture and flavour once reheated. You think that at pitch-black, pre-caffeinated 6am, I can remember to defrost something for dinner? Ain't nobody got time for that. I can't even remember to pack my lunch. I did have some rare free time one weekend, and I wanted to create something that was relatively easy, made little mess, and was a cinch to reheat - without defrosting. 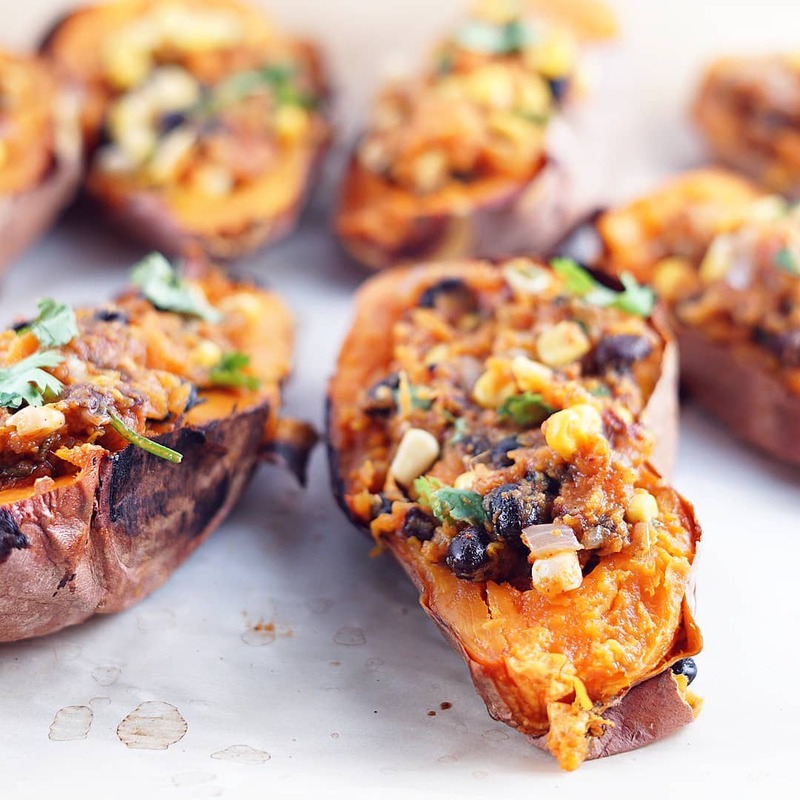 Enter the freezer-to-oven twice-baked stuffed sweet potato. This adobo flavoured marvel is just as delicious the day you make it as it is 3 weeks later when you re-heat it. Line roasting tray with parchment paper. Slice potatoes in half lengthwise and place face down on roasting tray. Drizzle with 2 tbsp. olive oil and season with salt. Roast for 30 to 40 minutes (less time for smaller potatoes), or until fork pierces easily into center. Remove from oven and allow to cool enough to handle comfortably. Meanwhile, heat olive oil in pan. Sautée diced onion until translucent. Add beans, corn and salsa. Stir until heated. Once potatoes are cool, flip them over and scoop out most of the flesh, leaving a small border around the peel. Mash up the removed flesh & combine with bean mixture and chopped cilantro. Fill potato skins with mash mixture. Serve hot. IF FREEZING: Allow to cool completely. To freeze, wrap in greased aluminium foil and place on baking tray. Allow to freeze completely before stacking. To cook from frozen, preheat oven to 425F. Place foil-wrapped potatoes on baking tray. Cook for 35-40 minutes, until potatoes are hot. Serve with shredded cheese, mashed avocado and extra salsa if desired.